Guts and Glory Tennis continually playtests and evaluates strings with the goal of identifying the best performing strings for our customers. Modern technology has allowed the production of poly-based strings to take quantum leaps forward in terms of overall performance. WeissCANNON has been leading the charge with the most innovative and advanced poly-based string products in the marketplace. Guess what? THEY'VE DONE IT AGAIN! The Turbotwist is poised take the reigns as the "most versatile poly-based string currently in production!" This string takes poly-based strings to dizzying new heights in regard to overall performance. No other string can match it in terms of ability to combine the desirable elements of poly-based strings with the comfort and power of plush synthetics. It is a unique hitting experience. So unique, in fact, the process used to create it is patented. No other string in the world plays like it, and the patent assures the playing characteristics will remain unique to WeissCANNON. Construction: Monofilament poly-based. WeissCANNON uses chemicals unique to them in the production of highly elastic co-polymer fibers which are twisted approximately 200 times around a longitudinal axis. Separate independent work processes including extrusion, stretching, heating, drilling and cooling contribute to the complicated manufacturing of this string. This string in manufactured to ISO 9001standards and is certified as such to assure ultimate consistency and reliability. Advantage: Once again, WeissCANNON is leading the way in the development and evolution of poly-based strings. This advanced product delivers outstanding spin along with pinpoint control, power on demand and a level of comfort not found in other poly-based strings. It delivers a very lively, comfortable and controllable performance. Well suited for all levels of players, but discriminating advanced level players who are able to distinguish performance characteristics will probably be the group most likely to appreciate the versatility and inherent genius of the string. Why we carry this string: It would be irresponsible not to make it available to our customers. It is quite possible the Turbotwist is the perfect combination of power, spin, control and comfort that many of our customers seek. Yes, the twisting process does create coil memory that makes it a bit less easy to install than other string products. Yes, it feels very firm and wire-like out of the package. But once installed, the performance reaches height previously untouched. It is a terrific playing, highly-sophisticated and advanced offering. Modern technology has allowed the production of poly-based strings to take quantum leaps forward in terms of overall performance. WeissCANNON has been leading the charge with the most innovative and advanced poly-based string products in the marketplace. Guess what? THEY'VE DONE IT AGAIN! The WeissCANNON Turbotwist succeeds at finally reaching the illusive goal that string manufacturers have been aiming for with new poly-based strings over the past several years. It is a string that offers the control and spin of a traditional poly-based string along with the comfort, feel and power of a multi. The Turbotwist could very easily become the holy grail of strings for many of today's players. The Turbotwist is poised take the reigns as the "most versatile poly-based string currently in production!" This string takes poly-based strings to dizzying new heights in regard to overall performance. No other string can match it in terms of ability to combine the desirable elements of poly-based strings with the comfort and power of plush synthetics. It is a unique hitting experience. So unique, in fact, the process used to create it is patented. No other string in the world plays like it. Construction: Monofilament poly-based. WeissCANNON uses chemicals unique to them in the production of highly elastic co-polymer fibers which are twisted approximately 200 times around a longitudinal axis. Separate independent work processes including extrusion, stretching, heating, drilling and cooling contribute to the complicated manufacturing of this string. This string in manufactured to ISO 9001 standards and is certified as such to assure ultimate consistency and reliability. Comments: The TurboTwist is an entirely new breed of string animal. It does not fit into the poly-based string kingdom, nor does it fit into the world of synthetics. Rather it is a class of it’s own. In a word, it is INIMITABLE. From purely a construction point of view the Turbotwist is classified poly-based family, but it is a rebel. The level of comfort, the power level and the feel will make the user swear s/he is hitting with a crisp synthetic. In fact, because of the high level of elasticity, the manufacturer suggests stringing at the same tension as multis. No need to drop tension like you do with firmer poly-based strings. These strings, like natural gut, need a bit higher tension in order to tame the inherent power. Even though the feedback you receive will make you think you are hitting with a synthetic, properly strung you are going to realize the control you get with a poly-based string. It truly is remarkable. The spin potential with this string, in a full stringbed setup, is as good or better than any. You will be hard-pressed to find a more spin friendly setup. As an added bonus, the longevity of the Turbotwist is exceptional. This string does experience an initial tension loss on par with most synthetics, but after the initial loss, it locks in and holds properties for a prolonged period of time. In terms of durability, it is poly-based string like performance all the way. Why not conduct a personal playtest today? We have tried to make it easy by allowing you to place a set or more in your shopping cart directly from the left column of this page. 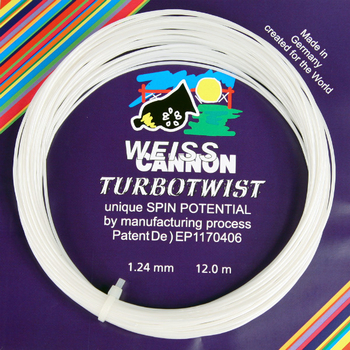 Please follow the WeissCANNON Turbotwist 660' Reel link if you prefer to save money by ordering in larger amounts. I strung my mains with Scorpion 1.22 and the Cross strings with turbotwist 1.18. This combination seems to keep the control I like with added topspin. Your TurboTwist 1.18 product is without a doubt the finest string on the market today. As a long time consumer of poly and poly-based string (with emphasis on Luxilon and Babolat), this offers far superior performance (exceptional control and spin), is more durable, and holds tension better that any of the competing products. It’s a bit more of a challenge to string than others, due to the amount of memory, but that’s a very small price to pay for the pleasure of using such a fine product. BTW, this tendency is not as pronounced with the reel since the wind is not as tight. Currently pairing this string with several Kneissl Black Stars results in incredible performance. Have not found a better combination. Thanks for your efforts. The search for the ultimate string is over! Reviewed Wed, Dec 22 2010 8:04 am by Zeke S.